Intel announced their new Ivy Bridge processors this week. They are built on the company's 22 nanometer production process and offer performance improvements on both the CPU and graphics side when compared to the previous generation Sandy Bridge. Just like on Sandy Bridge, Intel has integrated a quad-core CPU, graphics, cache, memory controller and PCI-Express connectivity into a single silicon die. The new 3D transistors offer more performance, while using less power at the same time. Please note, that the 3D transistors have nothing to do with 3D gaming at all. "3D" is simply a marketing term to explain the physical layout of the transistor, compared to the previous flat transistors. On the CPU side things haven't changed that much, it's still a quad-core design, featuring Hyper-Threading on select models, which effectively doubles the number of threads to eight. Intel has done some small improvements to their CPU cores, combined with the higher clock speeds, this results in about 15-20% increased performance for number crunching applications. The biggest changes can be found in the graphics core. It adds support for DirectX 11, which puts it on the map to play the latest games. Intel has increased the number of execution units from 12 to 16, which by itself will give a nice performance boost. We also see support for less common APIs like OpenCL 1.1 and OpenGL 3.1. When taking a look at the processor lineup, the most important difference is whether it supports "HD Graphics 4000" (Core i7 models) or the slower "HD Graphics 2500" (Core i5). The main difference between those two is the number of execution units for graphics (think "shaders"). These have received an overhaul and a single unit will now perform better than the same unit on Sandy Bridge. HD Graphics 4000 will have 16 of these, HD Graphics 2500 only six. There are tiny differences between models in the Graphics Max Dynamic Frequency, which is essentially Intel's CPU Turbo ported to the graphics world. It is not as elaborate as NVIDIA's GTX 680 Boost clocks, but works in hardware and still provides a healthy performance boost. In this review we will pit the Intel Core i7-3770K's integrated HD Graphics 4000 against a selection of typical low-end graphics options from the sub-$100 segment. We will use the same test suite as in our regular VGA benchmarks, but please note that we turned down the settings to low, to have a more realistic load for these low-end graphics processors. Unfortunately we can not include previous generation Sandy Bridge graphics in our tests, since it does not support DirectX 11. 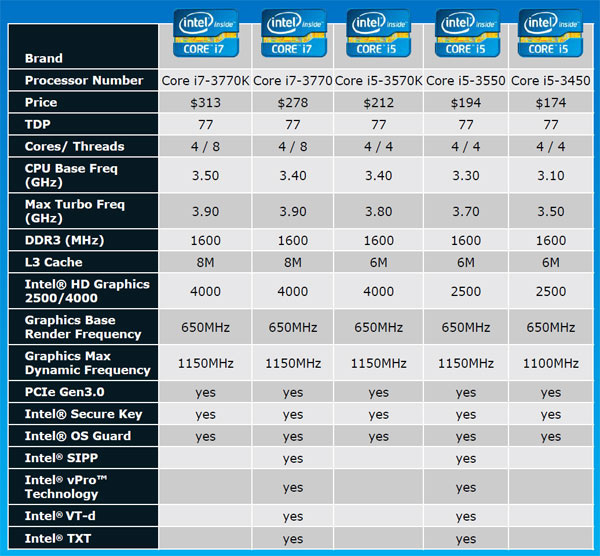 The Intel Core7-3770K retails at $313. Intel's new Ivy Bridge processors deliver significantly improved graphics performance when compared to the previous generation Sandy Bridge processors. Since Sandy Bridge has no support for DirectX 11, we could not include it in the benchmarks for this review. So let's do some math: Back in 2011 we saw that NVIDIA's GeForce GT 430 was 2.67 times faster than the Core i5-2500K's HD graphics 3000. Today GT 430 is just 1.71 times faster than Core i7-3770K HD Graphics 4000 in this review. So Ivy Bridge Graphics is 56% faster compared to the previous generation (=2.67/1.71*100-100). This is a pretty impressive gain that easily tops what we are seeing generation-to-generation on current discrete graphics cards. Intel has also introduced DirectX 11 support to their new IGP family, which means it now supports all the latest games. Looking at FPS numbers in our results, which were done at low quality settings, it becomes clear that you can't run all games with HD Graphics 4000 - no matter how low you set the details. Other titles, including Battlefield 3, Crysis 2 and World of Warcraft are "playable" now. This doesn't mean that you get the full experience that a typical gaming rig can provide, but it might still be enough for rare gaming sessions. More casual games that focus less on graphics, like Star Craft II, run pretty good at 60 FPS+. Last year saw the introduction of AMD's Lllano Fusion graphics, which shattered the limits of features and performance that integrated graphics could provide. Intel's new graphics generation has gotten much closer, yet cannot beat AMD's last year offerings in terms of performance. Also AMD has a massive price/performance advantage. Basically you can build an entire AMD Llano system for the price of the i7-3770K CPU alone. In the past, Intel's drivers have had a bad reputation for lacking features, game support, or stability. I'm happy to report that this is no longer the case. During our testing I couldn't find a single issue or rendering error. Thanks to the outstanding CPU performance of Ivy Bridge, the Core i7-3770K will be great to build a high-performance productivity machine that handles all desktop and media playback tasks easily using integrated graphics. Casual gaming at low resolution, low details might be ok too, but everybody who calls himself "gamer" should really look at a discrete graphics card. Combining the awesome CPU power of the 3770K with a gamer-class AMD or NVIDIA card will give you a much better gaming experience than relying on the low performance of the Intel HD Graphics 4000. Gamers on a tight budget should not blow all their money on a fast processor alone. It might be better to consider a more affordable processor like the i5-2310 and pair it with a Radeon HD 6870 (both are currently price/performance kings) so they end up with a balanced system that can handle most games at decent settings.